This photo shows the one and only outlet in the room for the air-conditioning. This will be completely reconfigured so that air will drop into the room and be dispursed evenly throughout. The unit is the original lunair. 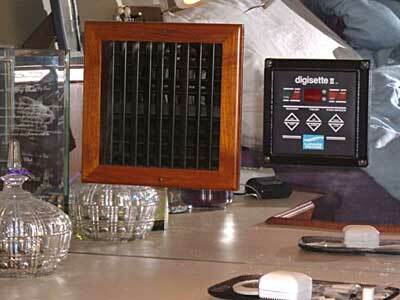 DOMETIC to the rescue! This hole is the begining of the new system. 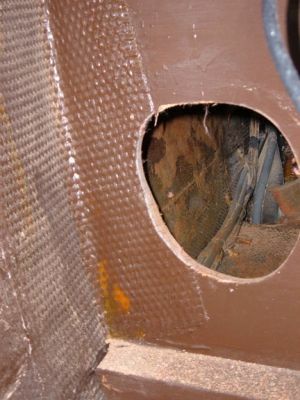 The hole is cut to run duct work. The air handler will push air into a "T" that splits into a 4" and 6" duct. 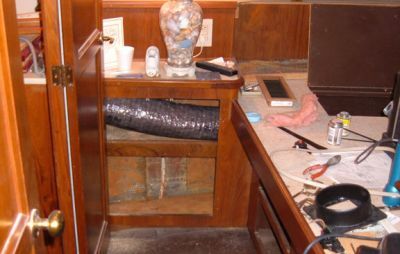 The 6" duct will run from the air handler, located under the head of the bed and right under the cabinet, up through the corner and aft wall. 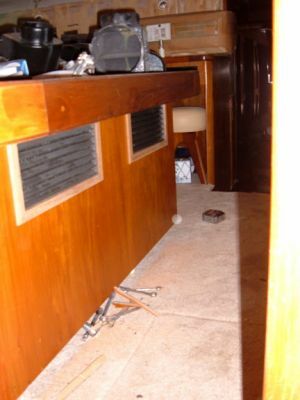 We will cut a piece of teak plywood to cover the duct. Once through the wall, the air will be split three ways. 4" for overhead, 3" into lower dressing area, and 3" into the existing duct which flows forward to the head. 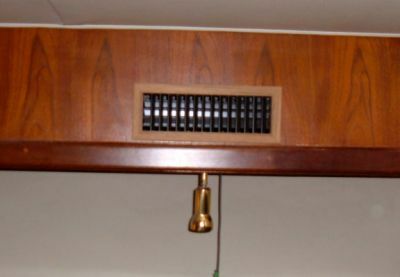 The original system had one 5" outlet placed mid level in the room and a 3" outlet into the head. The new system will have two 4" outlets into 4x10 vents at the ceiling level. It will also have a 3" outlet into the lower dressing area and into the head. Two returns will be placed below the foot of the bed. 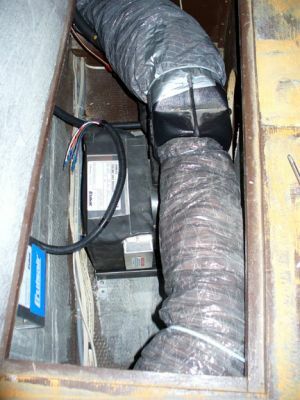 This photo shows the 4x10 vent (that the 4" duct goes into). 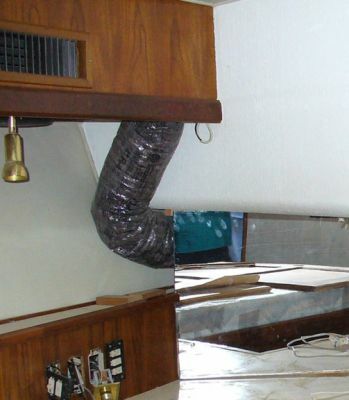 The remaining 4" duct split from the air-handlers "T" will conect to ducts that will go left through cabinets, into head, and back to the second 4x10 vent (shown here). At the far left corner you can see the hatch in the bed where the air handler will be placed. Looking to the right you can see the 6" duct coming up through the vanity and then through the wall. The intakes for the 10,000 BTU unit are at the foot of the Master bed. While the preference would be to place them lower, we placed them at this height for aesthetic reasons. Because the bed overhangs the vent wall, you will not be able to see them when walking into the room. 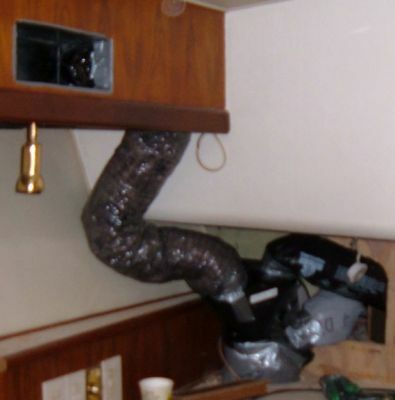 The four" duct runs under the bedside cabinet through the head and then up to the overhead vent. 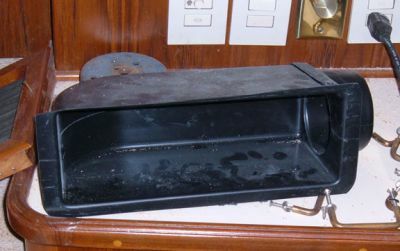 This is the collector box needed for the two vents. 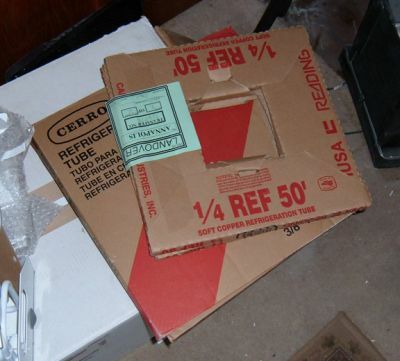 Unfortunately, we could not get the box into the space through the vent hole or into the space from the backside of the area. We cut the collector in two, we will place the pieces into the hole and then glue them together. The new units are fed by the Cruiseair compressor in the engine room. This copper tubing will be run from that compressor to the air handler unit. 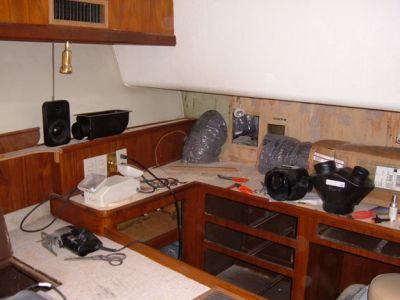 A repeat of this process will be done for each of the three staterooms as well as for the two units in the salon. The collector box, upper left, is glued back into one piece and fastended in place. 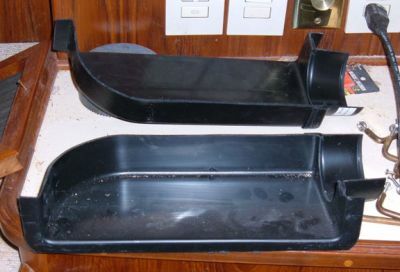 The lower right shows the air dividers. The lowest divider breaks the 6" hose into a 6" and 3" hose, with the 3" routed to the Master Head. 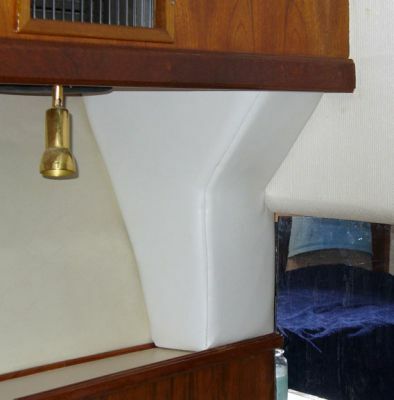 The next divider splits into a 3" duct that is routed to the dressing area and a 4" routed to the vent over the bed. 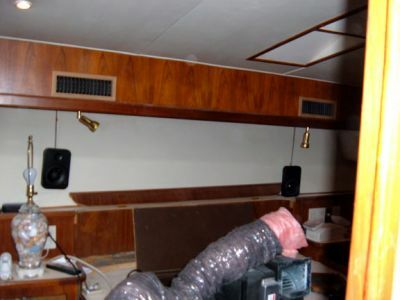 The unit is mounted under the Master Stateroom bunk. Silent running has been painted on four sides of this area. The electrical box and SMX control box are also mounted in this location. The copper lines have been connected and the unit is ready to be wired. 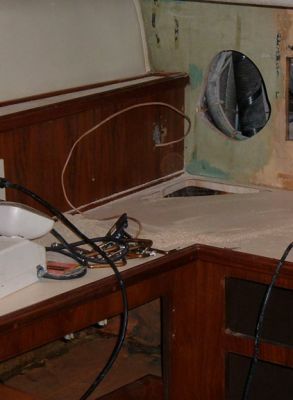 The mirror was cut and installed over the board that covered part of the duct work and the old mirror was reinstalled into the vanity area. We need to cover this ugly duct now! We cut and fitted a box to cover the duct work; then covered it with 12" foam and our headliner vinyl.